Wholesale Trader of a wide range of products which include autofy car dashboard temples. Autofy brings good quality automotive accessories at very reasonable prices. Installing a temple in your car is important from a number of aspects. Not only they reflect your faith in your God but the presence of a manifestation of your faith has been proven to keep your calm and feel protected. This dashboard temple for all cars from Autofy is a must have accessory in your car. 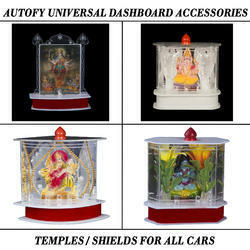 Autofy Dashboard Temple / Idol for all Cars is made of high quality acrylic plastic that adds durability to it. The ways of worship have always evolved with the passage of time. The of LED bulbs have been embedded into the temple so as to keep away the need of lighting earthen lamps. LED lamps serve a much greater purpose in the pursuit of making the temple vehicle-safe. Also, the LED lamps convert 90% of the electrical energy into light energy making the temple highly energy efficient. Thus, the temple does not drain car battery. The idol placed inside the temple has been carefully crafted to ensure decent depiction of the God and Goddess enshrined within the temple. The paint used in the manufacturing of the temple is of fine quality to make sure the quality of the appearance is maintained for a long period of time. Apart from car, the temple can also be installed in the premises of your office, living room, or can be carried wherever you go owing to its compact size. Installing the temple onto the dashboard of the car is also very easy as all it takes is a double sided adhesive tape. For the LEDs too, slight knowledge of electrical circuiting is enough to light up the temple.